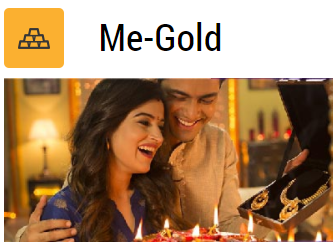 Me-Gold is new Digital Gold Investment options introduced by Motilal Oswal. Indians are fond of gold. Gold yellow shining metal is one of the most favorite options for the Indians. Gold is purchased by us at every auspicious occasion like marriage, birthday and festivals. There are multiple ways to invest in gold which we have already discussed on our blog. Today we will discuss Me-Gold Digital Gold Option by Motilal Oswal. It is claimed on the website of Me-Gold that it is 999.9 pure gold. This means you need to worry about the purity of the gold. This is 24k pure gold. This means gold hallmarking is not necessary. Although it is digital gold investment option, gold purchased using this option is safe. Gold is vaulted in 100% insure facility at MMTC, PAMP for free. You have the option to start with small amount Rs.1000. In weight smallest unit of buying is 0.5 grams. This feature enables lower and middle-class people to invest in gold. Also Read – Paytm Digital Gold – How to Buy Sell Digital Gold? Making charges in Me-Gold is zero. You need to pay only when you want to have physical delivery of gold. This feature makes this option cheaper. KYC is mandatory while you invest via Me-Gold Investment option. You need to purchase valid KYC documents. You can sell this gold online anywhere anytime. The entire process is online with zero paperwork. You can also convert this gold in physical gold and get it delivered. This works on live gold price. Live gold price means the gold rate in Indian Rupees (INR) per gram of (999.9) fine gold as posted from time to time, inclusive of customers duty, exclusive of (i) Taxes (ii) product manufacturing/making charges & (iii) delivery charges. It seems to be very good scheme offering transparency backed with a trusted name like Motilal Oswal. It also offers an option of accumulating Gold Systematically using Gold Accumulation Plan. Read –How to calculate Gold Ornament Price? Me-Gold – Should You Invest? You must know some important points before making investment in Me-Gold. This scheme is for 5 years’ time frame. You need to compulsory sell or take physical delivery of gold. You need to continue transaction using Me-Gold account. 18 months of inactivity leads to deactivation of account. You cannot cancel your gold purchase. Once MMTC-PAMP has accepted your offer to buy, cancellations or refunds are not allowed. Compared to Me-Gold, Gold ETF is good and cost effective investment option. You should select Gold ETF if you are planning to invest in gold. Overall looking at gold price it is not wise to invest in gold at this point of time. Gold price seems to be stagnant. If you are happy with low return you can invest in gold. 5 Digital Gold Purchase Options – How to Buy Gold Online? Paytm Digital Gold – How to Buy Sell Digital Gold?